If you own multiple devices from different manufacturers and different platforms such as Android and iOS you may be interested in a new cable which is designed to provide cross device charging using magnetic connectivity. 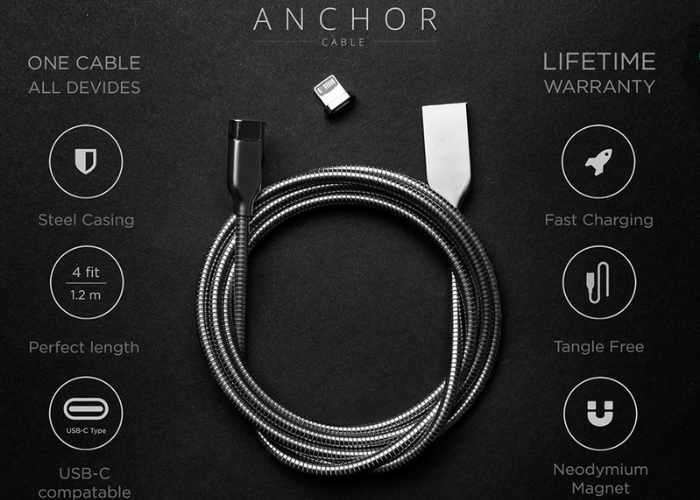 Provided with Android, iOS and USB-C connections the Anchor Cable created by a team of developers based in London UK is being marketed as the world’s first stainless steel, magnetic cross device charging cable that supports the new USB-C connection. Watch the video below to learn more about the charging cable which is now available for earlybird backers via Kickstarter priced from £23 with free worldwide shipping included.